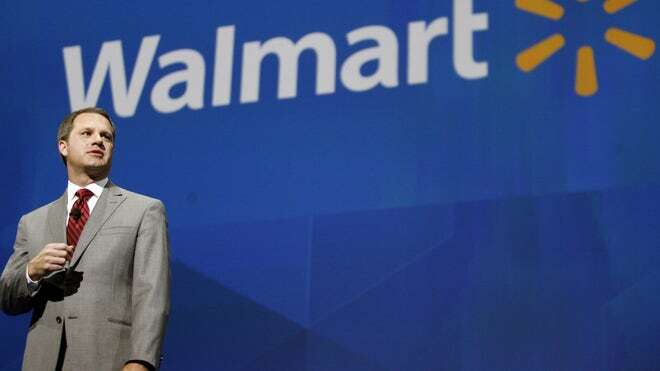 Haters will hate without thought but anyone with any real knowledge of how Walmart has benefited hundreds of thousands of people would laugh at your "cancer" assertion. Have you heard about the Walmart WAREHOUSE SLAVE from Tulsa, Doug McMillon? He is now the Walmart CEO! He worked at our local neighborhood store. McMillon, who earned his bachelor's degree at the University of Arkansas, had his first job at Wal-Mart in a distribution center in Arkansas as a summer associate in 1984. He left the company and came back in during grad school at the University of Tulsa, working here for one year. Since working in Tulsa, McMillon has worked in several divisions in the company, including food, apparel and general merchandising. That experience extended to Sam's Club and Wal-Mart International.He has now been with the company for 22 years and at 47 years old takes over a company with 11,096 stores in 27 countries. But please ignore reality if it doesn't fit your belief system. FAYETTEVILLE, Ark. – Employment in Northwest Arkansas grew by 3 percent from 2011 to 2012, a rate that outstripped the growth rate in peer regions, the state and the nation, the third State of the Northwest Arkansas Region Report shows. At 3.0 percent, the pace of employment growth in Northwest Arkansas between 2011 and 2012 was almost twice as fast as the national rate and five times faster than employment growth in the state of Arkansas. In 2011 and 2012, the number of businesses established in the region grew slowly after declining in 2009 and 2010. When compared to competitor regions, Northwest Arkansas was tied with the Tulsa region at 5.6 percent for the second lowest unemployment rate in 2012. From 2007 to 2011, the real gross domestic product in the Northwest Arkansas region grew by 7.0 percent. Research expenditures at the University of Arkansas increased 12.7 percent from 2007 to 2010, giving the state’s flagship institution a rank of 135 among all universities. Nearly 28 percent of adults in Northwest Arkansas had attained a bachelor’s degree or higher by 2011, while just over 20 percent of the state’s adult population had advanced degrees. Edited by Rogerdodger, 18 January 2014 - 01:20 PM. So if we look at each of the ever growing number of blue dots as hundreds of people finding employment, to now over 1,400,000 jobs (jobs which pay more than Target btw), then we see the free market providing what Obama's government "shovel ready" trillion dollar "Laser Beam Focus" on jobs has not. Add the number of construction jobs for each one of those stores as well as the local suppliers and you begin to wonder how we could have survived without the free market stimulus provided by Walmart. In fact the worse problem with Walmart is finding a parking space, the stores are so popular. Maybe America's real cancer is an ever expanding, intrusive, over-regulating federal government ready to stand in their way. PS: Why not open your own store and pay your employees a huge "living wage"? Just wondering. Edited by Rogerdodger, 18 January 2014 - 11:19 PM. One guess -- which is the worst? Not shopping local small businesses yet but if and when that comes, many communities, especially those in the Midwest, will begin the long slow walk back to being Main-Street America again. Edited by diogenes227, 30 July 2014 - 11:58 PM. "The secret of life is honesty and fair dealing. If you can fake that, you've got it made. " I can't wait until we get away from the free market and back to limited selection and empty grocery shelves. Edited by Rogerdodger, 31 July 2014 - 09:00 AM. At which Wal-Mart was this picture taken? Michael Young, a 63-year-old accountant in Oklahoma City, goes to Wal-Mart “only when I need things I know I can usually get for less money.” He has to prepare himself for what he knows will be an unpleasant shopping experience. “I really dislike the long checkout lines,” he said. Bobby Blackmon, 37, lives in Jonesboro, Arkansas, Wal- Mart’s home state. He travels for his job working with cranes -- and no matter where he goes, he said he always has trouble finding things at Wal-Mart. Two weeks ago, he was at the Wal-Mart in Baton Rouge, Louisiana, to buy energy drink mix, nicotine gum and ambrosia apples. Blackmon, who works as an emergency room nurse on the weekends, picked up some peanut butter and headed to a checkout line. “There was one register open, and I was the tenth person back,” he said. “It was ridiculous. I just put it down and left without it.” Several of his fellow customers did the same. Blackmon is married with four children, ages 12 and younger. And one of these days he might start shopping his local small businesses again, and there will be jobs there, and the profits will stay in the community and local families will flourish on family wages and benefits and taxpayers can quit subsidizing big-box infrastructure, and the barren Main Streets in the towns in the Midwest will come alive again -- that is what can happen when a real free market works without a predatory monopoly, like Wal-Mart in its midst. The only thing I can't find is 22 LR ammo. As usual it is the distinction between the symptom and the disease. It usually starts and ends with one singular disease cause. I would say it is theft of labor. Which is currency destruction, which is inflation, which is slavery. they have run the course of the most that they can do, crossing deminishing returns. I see their shelves getting more sparse, more empty. Crossed the occult massacre threshold. Here is a timely article from ZH illustrating these points. What would the victims do to eat, without walmart. the Krugman debt and war Keynesian occult. by way of the despised, work. More and more will fall into the occult, no work to do, means no distinction. denominator, such as federali education example. Not much time to get the most wealth off matrix.